Space exploration is a tricky business, especially when it comes to maintaining a strong signal to planet Earth. NASA maintains an array of communication facilities worldwide just to download data from deep-space probes. Future interplanetary missions involving multiple landers and rovers need a way to all talk to each other that doesn't involve radio, and that's where Vodafone and Nokia come in. Back in March 2017, a group of volunteer scientists and engineers in Germany (known as PTScientists) announced it was planning the world's first private Moon landing, using SpaceX's Falcon 9 rocket. The goal was to deploy two lunar rovers to explore the Taurus–Littrow valley, the landing site for Apollo 17 (the last mission that took humans to the Moon). The group encountered a problem when NASA asked them to land more than 2 kilometers away from Apollo landing sites (so they won't be covered by dust). The German lander and the rovers would not have a direct line-of-sight, limiting radio connections. Vodafone stepped in and developed a communications system in partnership with Nokia, based on LTE and C-V2X (a planned extension to LTE, for smart cars). It would allow each rover to be a base station, relaying data to the lander as the other drives into the valley. In other words, the lander and both rovers would maintain a LAN connection over LTE - a 'Lunar Area Network,' if you will. PTScientists claim the LTE network will also allow the rovers to transmit HD video to Earth, by connecting the lander to a "Deep Space Link" (which seems to be different than the various Deep Space Networks the US and other countries have already set up). That's quite a step up from the monochrome 10FPS video that the Apollo 11 astronauts used in 1969. It's always interesting to see how technology designed for use on Earth can improve space exploration, and vice-versa. Maybe the next time humans step foot on the Moon, it will be livestreamed on Twitch. Dusseldorf, February 27, 2018 - 50 years after the first NASA astronauts entered the moon, the Earthbrab is getting an LTE network: Vodafone is developing the first mobile network in space, thereby supporting the PTScientists "Mission to the Moon". To this end, Vodafone today announced the choice of Nokia as its technology partner at the Mobile World Congress (MWC). The Berlin company PTScientists is working with Vodafone Germany and Audi on the first privately financed moon landing. The mission is to be launched from Cape Canaveral in 2019 with a SpaceX Falcon 9 rocket. 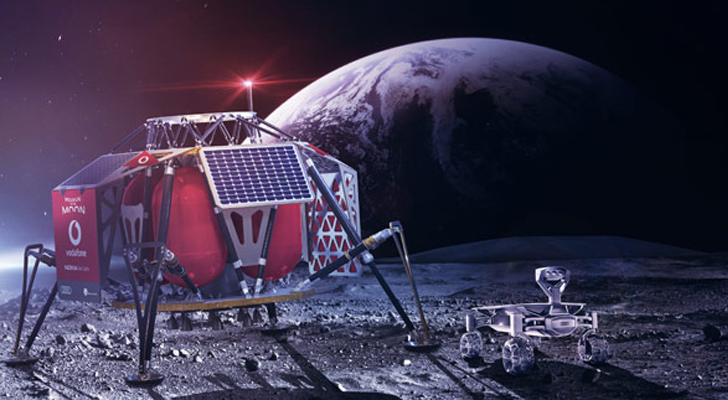 The network expertise of Vodafone will be used to build the first LTE network on the Moon: The network will connect two Audi lunar quattro Rovers to a base station in the Autonomous Landing and Navigation Module (ALINA). Nokia will develop a space-efficient and ultra-compact network using Nokia Bell Labs. In addition, it will be the lightest that has ever been built today: weighing less than a kilo - just like a packet of sugar. The LTE network will allow the Audi lunar quattro rovers to transmit scientific data and HD video as they carefully explore the NASA Apollo 17 lunar vehicle. This is exactly what the last astronauts used (Commander Eugene Cernan and Harrison Schmitt) to explore the Taurus-Littrow valley in December 1972. Vodafone tests show that the base station should be able to broadcast for the first time live HD video of the lunar surface via LTE and make it accessible to a worldwide audience. The 1800 MHz frequency band is to be used. The station is connected via a so-called "Deep Space Link" to the servers in the Mission Control Center of the PTScientists in Berlin. An LTE network is very energy efficient compared to analogue radio and will be crucial to the success of "Mission to the Moon". At the same time, this is the first step in building a communication infrastructure for future missions. Vodafone Germany CEO, dr. Hannes Ametsreiter: "This project demonstrates a whole new approach to mobile infrastructure development, and it's also a great example of an independent, versatile team that has achieved a mission of immense importance through courage, pioneering spirit and inventiveness." Robert Böhme, CEO and Founder of PTScientists, said: "This is a crucial first step towards sustainable solar system exploration, so that humanity can leave the cradle of the Earth, we must develop infrastructures beyond our home planet - the 'mission to the moon' We build and test the first elements of a dedicated communications network on the Moon, and the great thing about this LTE solution is that it saves so much power - and the less energy we use to transmit data, the more we can do science! " Marcus Weldon, Nokia's Chief Technology Officer and Nokia Bell Labs President: "We are delighted to have been selected as a technology partner by Vodafone, a key mission that will help develop new space technologies for future data networking, processing and storage will help to improve the communication infrastructure needed to carry out lunar research for science, industry and educational institutions.These targets have a potentially far-reaching impact on many stakeholders and all of humanity and we look forward to seeing them launch in the coming months to work closely with Vodafone and the other partners in 2019. "